The state of politics in the UK has been abismal for a long time but the way women are being treated in the global political arena, with the US president demeaning women on a weekly basis and the Japanese Prime Minister's re-shuffle including just one woman in his 19-member cabinet, it feels lately like every day I'm suppressing feelings of anger, helplessness and frustration just to maintain my sanity. It's heartening to know that more women than ever are running for US office this year but still, the message that the actions of these world leaders are sending to young women is deeply worrying. And the media's obsession with appearance that is actively putting girls off going into politics is doing nothing to change the fact that less than 25% of the world's politicians are women. 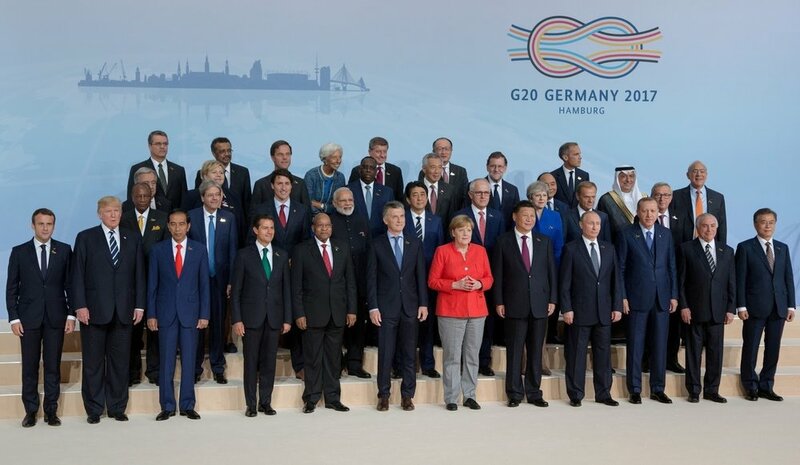 The 2017 "family photo" from the G20 summit with just three women: Angela Merkel, the Chancellor of the host nation Germany, Theresa May, the British prime minister and Norway’s Prime Minister Erna Solberg. IMAGE: Reuters. We of course have Jacinda Ardern, New Zealand's Prime Minister, as a leading light who has given women cause for celebration, breaking the norms combining motherhood with her role, but even she faces the no-win and sexist criticism the rest of us get for doing both. Jacinda Ardern defending her Air Force ride to Nauru. IMAGE: New Zealand Herald.